You Are Here >> Home » Frugal Living » How to Save Money » How to Save Money Eating Out and Enjoy it too! One thing many people give up when they go to a frugal lifestyle is eating out at restaurants. Eating out can be a huge money waster if you do it too frequently and without care. Living frugally does not mean you have to give it up, entirely, however. I have compiled a list of tips to show you how to save money eating out to help you enjoy a night out once in a while and not spend as much as you would think. 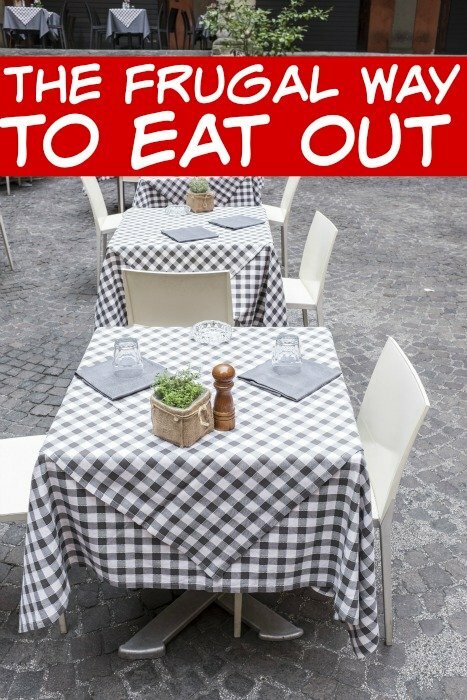 Tips on how to save money eating out. Always look for coupons. Some can be found in monthly circulars you get in your mailbox as well as in places you might not even think; such as on social media. Facebook pages of your favorite restaurants may occasionally release coupons you can print out if you are a fan. Sign up for “clubs” that many chain restaurants offer. 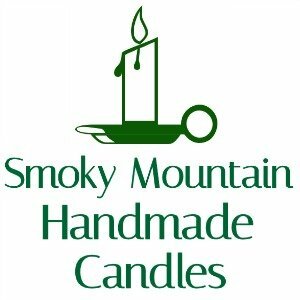 These are often free and you will get occasional deals and coupons in your email and snail mail with free meals on birthdays and anniversaries as well as BOGO meals on special days. Know what days your favorite places have a “kids eat free” night. Knowing this can really save you a lot as most of the time, you can get 2 kids in for one adult meal for free. Skip soda and dessert as well as appetizers. Instead, drink water. If you feel the need to have dessert, share it. You are usually too full by the end to eat one by yourself anyway. If you want the eating out experience, but are especially low on funds, try eating the meal at home and as a treat, going out for just dessert and coffee. Instead of doing individual meals for everyone, buy a couple appetizers and share as a family. During the Holiday season, you can often buy discounted gift cards for restaurants. 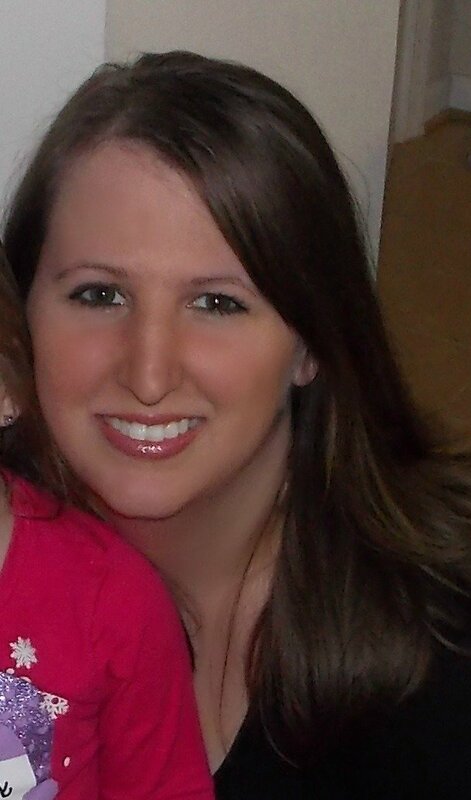 I saw several last year that offered a free $25 gift card for every $100 in gift cards you bought. Stock up on these for yourself and use them throughout the year when you get that hankering to eat out. Use sites like groupon.com and restaurant.com to buy discount gift cards and deals. 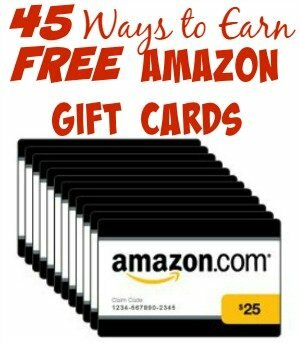 You can also use my list of 45 places to earn free Amazon gift cards and just cash out for cash or restaurant gift cards instead of Amazon gift cards. Sign up for reward cards at your favorite places. One of my favorite joints gives you a $10 gift certificate for every $100 you spend and they let you combine it with coupons. I combined it with a BOGO meal deal and ended up only paying for my drinks out of a $30 meal. Outside the box, ideas to save money eating out. Use social media to get yourself discounts. Many places are now giving a free appetizer of drink for “checking in” on Yelp! Or Foursquare. Order a lunch entrée for dinner. These are usually just slightly smaller in portion, but a significant price difference. Keep in mind some places will only serve lunch portion during a certain time frame but other will allow it all day. Eat on less busy nights of the week when restaurants are more likely to have a daily special. Typically, this is midweek. Avoid Friday, Saturday and Sunday nights and they are the busiest. Find a place you love and become a “regular”. When you do this, you may be surprised at how much the wait staff or owner appreciate your business and will give you discounts or even free menu items. This has happened to my husband and I a few times one place we would always get free cheese bread (that we loved) and a free dessert on the nights we had a drink or 2 (then walked back home since the place was right around the corner from our house). Ask about discounts for military, seniors or college students. 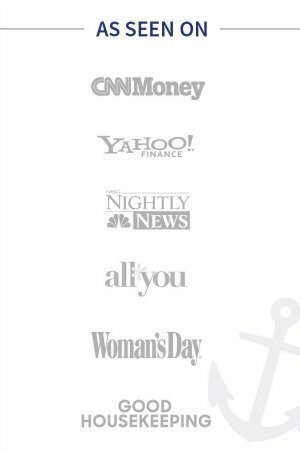 Often, many places offer at least 10% off for these groups of folks. Split the meal with friends. Order a bunch of food that can be shared and split the meal with someone else. Don’t eat out too often. Use eating out as a treat and only when you sincerely don’t have time to cook, or are celebrating something special. Keep in mind, tip fairly. Just because you are getting a great deal, don’t think your server deserves a percentage of the discount price. Tip for the full price of the meal if the server did well. 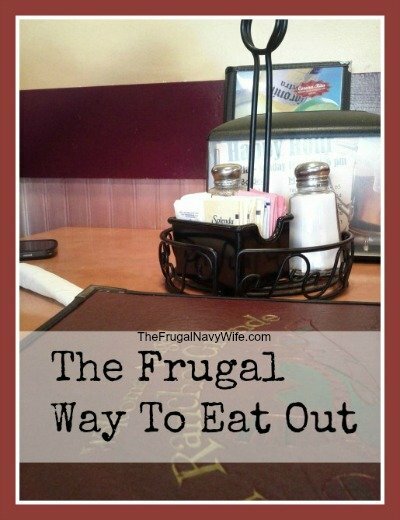 If you liked these tips on how to save money eating out check out these Frugal Living Tips. One thing we do when we do want soda is we buy one soda and my husband and I split it. The other will get a water which is usually free. Refills are usually free also. Also if your a vegetarian usually you can explain that you are and they will let you order off the children menu or give you a discount because you had to take so much stuff off your meal! Order foods that make good leftovers. Restaurant portions are often very large, so if you are not sharing the meal then plan to take it home and make the leftovers a lunch or the basis for another dinner. Stretch that eating-out dollar! Thank you for saying that about tipping! The people that serve you need to make a living too. Smokey Bones has really great coupons on a regular basis in our Sunday paper…usually $10 off a $20 purchase. If you join their Bones club, you get points for every dollar you spend and then get $20 off your meal once you get 200 points. For a while they were tripling points whenever you went when a football game was on. We got $20 off our meal almost every other time we went!